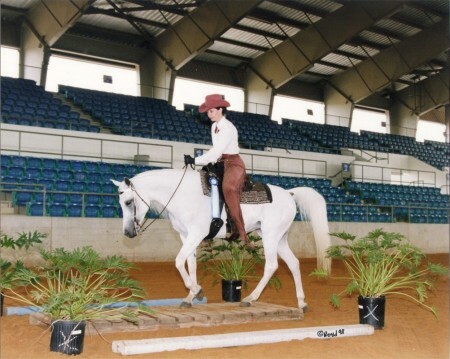 Arabian Horse Association Legion of Supreme Honor Champion; competed in dressage, trail, western pleasure, hunter pleasure, and sport horse classes. Ansata Mara retired from showing in 2005 to a life of well-deserved leisure to become the alpha mare of our horses. She fully recovered from founder in one foot in 2002 and resumed an active life including showing. A sweet and loving Arabian mare, kindred spirit, and friend, sadly Mara passed into endless green pastures in 2014 at age 25. She came to us as a gift from friends at age 7. Her son made her a grandmother 68 times and a great-grandmother 10 times. She is very much missed in our lives, for she was the horse you would ride if your life depended on your horse.